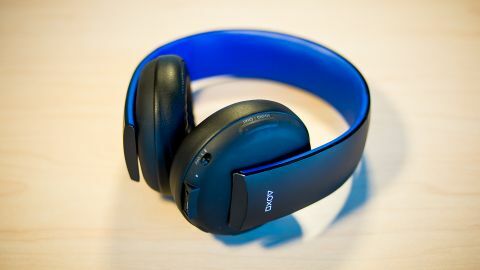 Delivering great performance in a sleek, streamlined, and comfortable design, Sony's PlayStation Gold Wireless Stereo Headset is a very affordable virtual 7.1 surround sound option for PlayStation 4 and PlayStation 3, and stereo connectivity for the PS Vita and the new PS Vita Slim. And unlike many other premium gaming headsets, you don't need to be an audiophile, or even mess around with the wires behind your console to set it up and start soaking in the booming action of games and movies alike. Just plug in the USB dongle on the console, flick the switch, confirm your user profile, and you'll be up and running within seconds. At the same $99 price point and with a similar feature set as the company's previous Wireless Stereo Headset, the Gold version ostensibly replaces that earlier PlayStation 3 peripheral with a better build, more appealing overall design, and fold-in earpieces. More elaborate (and certainly more expensive) headsets serve as the Gold Headset's primary competition, but when it comes to utter ease of use and especially baked-in compatibility with PlayStation 4, it's hard to argue against Sony's latest option, which lives up to its glossy branding. Black and blue (but far from looking beaten up), the Gold Wireless Stereo Headset sports a nicely minimal design with one solid arch around the head and a pair of large cans on each end that can slide up or down several notches for fit. Those cans also fold into the center on well-defined hinges and loosely click into place, making it easier to store using the included travel pouch. All of the controls are comfortably located on the left earpiece, including the power switch that also lets you swap between two customizable audio profiles (using the PlayStation Headset Companion app on the PlayStation Store). You'll also find volume up and down buttons, a mute button, another pair that lets you set the balance between game audio and multiplayer chat, and a toggle button between virtual surround sound and standard two-channel stereo. It's the same set of options seen on the earlier Wireless Stereo Headset, but the build here is much cleaner and more attractive. Gone are the cheap-feeling sliders for volume and balance, now replaced by buttons molded into the rubberized plastic. Also missing is a visible microphone jutting out from the frame, as it's now built into the cans, unseen. And unlike that earlier headset, the Gold peripheral doesn't sound like it's going to break when you pull the two ends apart to sit it on your noggin. The sides of the headset feature customizable faceplates that can be swapped out for others that will surely be sold down the line, though for now you'll have to live with the PlayStation buttons logo on each side. Granted, we probably wouldn't wear this large headset on the subway regardless of faceplate, but surely someone might. The Gold Headset fits comfortably on the head with large, leather-covered, ear-enveloping cans, which are augmented by a silky, plush pad up top – so it'll rest on your dome for extended periods without issue. It still has a primarily plastic feel to it, which comes off a little clunky compared to more extravagant headset options. But for $100, it's impressively refined and very well considered throughout. We've heard broader, bigger sound from richer headsets, but for the price, the Gold Headset puts on a great show when it comes to games and movies alike. Hearing a dropship soar by out of view in Killzone: Shadow Fall was electric, and every satisfying round pumped into a Helghast enemy registered nicely – as did each brutal scramble for survival in Tomb Raider: Definitive Edition, and even the dulcet tones generated by shimmering petals in Flower. It all came through cleanly in our testing, with the virtual 7.1 surround sound performing admirably. Make no mistake: you'll never forget that you're wearing a headset. If there's a complaint to be made about the Gold Headset, it's that it lacks a largeness of sound, and it doesn't have the range of higher-end devices. Among premium headsets, it's an entry-level one – but it's darn good for that. And it's stellar for films, as well. Grabbing a download of Pacific Rim from the PlayStation Store, we heard the towering Jaegers' artillery shots whizz by and crash into the creeping Kaiju, all while Idris Elba barked his unending disappointment. And that was just a 5.1 signal. With a full virtual 7.1 running on a Blu-ray flick, you'll catch even more detail and subtlety in the signal. With the factory settings, the bass is a bit thin; and due to the streamlined design, you won't find any controls on the headset itself for tweaking the signal. For that, you'll need to download the free PlayStation Headset Companion app, which lets you select from genre-specific presets or freely tweak the bass, mid, and treble. However, since this is done from within a separate app on the console – and it doesn't provide audio samples to work with – you'll have to take a blind shot at the levels and then pop back and forth to find the right balance. This is especially irritating while watching a Blu-ray film, as you'll have to fully exit playback to use the app. Game-specific audio profiles are set to debut soon – Infamous: Second Son should be the first – but none are available as of this writing on PlayStation 4, and it's unclear whether third-party games will regularly offer them. Still, what comes through the Gold Headset is a strong and clear signal; perhaps not with the range of a $200-300 headset, but definitely a big step up from television speakers and plenty enrapturing enough to command your attention during long play sessions. Just be warned that it might grab the ears of those around you, as well. The Gold Headset clearly wasn't designed for privacy's sake, as the bulging sound emits pretty freely from the cans during use, and anyone in earshot will be able to easily pick up the sound of bullets fired, and maybe even stray dialogue. As noted above, connecting the PlayStation Gold Wireless Stereo Headset to your console and getting up and running couldn't be much easier. It ships with a small USB adaptor, which plugs into the front of your PlayStation 4 or PlayStation 3. On PlayStation 4, popping on the headset's power switch launches an on-screen prompt to assign the headset to an active user. One caveat to that: initially, there was no sound at all through the headset, as I had to flip through the Sound and Screen settings, go to Audio Output Settings, and direct the console to pump all sound to the headphones. It's odd that the system recognizes the headset and pairs it with your profile, but want's you to complete that last step on its own. However, once done, it's smooth sailing from then on out. As a wireless device, the Gold Headset is also compatible with PC and Mac using the USB adaptor and going through a bit of additional setup on each operating system. There's PlayStation Vita compatibility mentioned, but that's only by plugging in the included headphone jack into both the headset and your handheld. Similarly, the Gold Headset can function as standard wired headphones with an MP3 player, phone, or really any other device. While you won't get virtual surround sound through a headphone jack, the two-channel stereo playback is quite solid. Sony promises eight hours of battery life from a charge via its micro USB port, which you can link to the front of your PlayStation console during downtime. Our testing matched up well with the estimate, allowing for a few meaty gaming and film-viewing sessions before needing a charge. You'll need to be sure to flick the power switch off if you want to avoid battery drain once done playing, however. If you need something longer-lasting for daylong play sessions, the Turtle Beach Ear Force PX4 offers upwards of 15 hours on a single charge, but eight should be more than enough for the average user. Also, the Ear Force PX4 offers an advantage in connectivity, as it links up to Xbox 360 and has partial compatibility with Xbox One; many other headsets issued by third-party companies also allow such flexibility. For multiplatform gamers who don't want to own multiple headsets, that's a definite consideration. Sony's headset has dyed-in-the-wool PlayStation fans as its target audience, which is surely a sizeable crowd – but that focused approach might leave some searching elsewhere. Which is a shame, considering all this has to offer. Audio obsessives looking for top-of-the-line gear – and who are willing to spend for it – can find better gaming headset options on the higher end of the pricing chart, not to mention devices that work with a broader array of consoles. For everyone else playing on a PlayStation 4 or PlayStation 3 that wants crisp, clear sound without a lot of fuss, the Gold Stereo Wireless Headset is a very strong pick. While functionally very similar to Sony's previous entry-level headset option, the Stereo Wireless Headset on PlayStation 3, we love the newly streamlined build, which cuts out unnecessary frills to focus on an attractive and comfortable design. Foldable cups make it easier to transport and store, as well, and it comes with a headphone cable for use with PlayStation Vita and other audio devices. Sony's play with the Gold Headset is clearly towards accessibility and value above all, and in both regards, it's very much a winner. For a mere $100, you get a nicely refined peripheral that delivers quality virtual surround sound, a built-in mic for chatting and strategizing with online allies, and a nicely comfortable build. That's a pretty excellent deal for PlayStation-centric gamers.